Barbara Ericson, with the help of Phil Sands at Purdue, has now finished tabulating the demographic data for AP Computer Science for 2015 — see link here. We don’t yet have the statistical tests that Kevin Karplus asked for (see post here), but Barbara did list the percentage of Hispanic exam takers with their proportion of the population. Our blog posts on AP CS have been picked up by Audrey Watters in her 2015 Top Ed-Tech Trends summary, in a decidedly negative light. I’ll look at the whole “learn-to-code” push in an upcoming post, but I will note here: “Nationally, 37,327 students took the AP CS A exam in 2014,” Mark Guzdial observed. 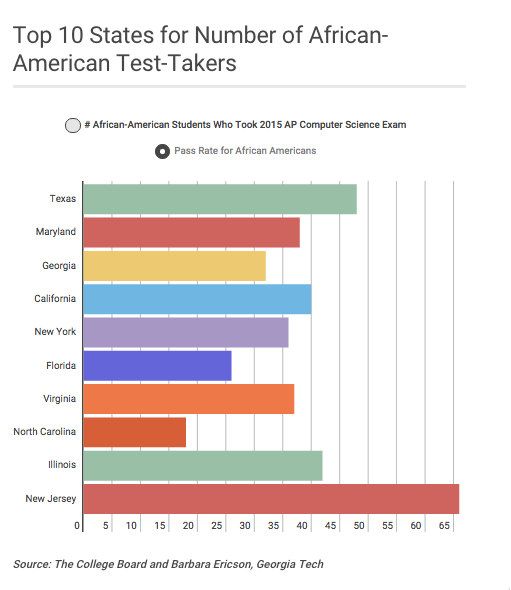 “This was a big increase (26.29%) from the 29,555 students who took it in 2013.” “Barbara Ericson’s 2015 AP CS demographics analysis: Still No African-Americans Taking the AP CS Exam in 9 States.” And Code.org teamed up with the College Board: because everyone needs to learn to code and then hand over money to the College Board for an AP test on the subject. Boom. We don’t analyze AP CS A in order to market for the College Board. We analyze AP CS A exam demographics because it’s the only operational definition we have found of the state of computing education across the United States. From our work in “Georgia Computes!” we know that AP CS A tracks closely all other computing education in Georgia. AP CS A is a dipstick to get a sense for who’s in the high school CS population. How many schools will honor the AP CSP attestation? It’s a substantive, important project — keep up the good work! I don’t know. My school currently has no plans for #2, 3, or 4, but we did sign the attestation. (I’m working on coming up with a plan at Georgia Tech, but am not getting much traction.) I don’t know about the status at other schools that signed the attestation. I expect that Duke and Berkeley are going to follow-through, since they have done #3. Some schools don’t give any or much credit for AP, so #2 may be out of the CS departments hands. I don’t know if there’s any legal requirement to follow through on the attestation. Normally, this is the time of the year when Barb writes her guest post about the AP CS exam-taker demographics. She did the analysis, and you can get the overview at this web page and the demographics details at this web page. But before we got a chance to put together a blog post, Liana Heitin of EdWeek called her for an interview. They did a nice job summarizing the results (including interactive graphs) at the article linked below. No girls took the exam in Mississippi, Montana, or Wyoming. (Though Montana had no test-takers at all, male included, this year. Wyoming, which previously had no students take the test, had three boys take the exam in 2015). Hawaii had the largest percentage of female test-takers, with 33 percent. The overall female pass rate went up 3 percentage points, to 61 percent, from the year before. No African-American students took the exam in nine states: Idaho, Mississippi, Montana, New Hampshire, New Mexico, North Dakota, South Dakota, Utah, and Wyoming. That’s better than last year, though, when 13 states had no African-American test-takers. Notably, Mississippi has the highest population of African-Americans—about half of the state’s high school graduates last year were black, according to the Western Interstate Commission for Higher Education. Yet of the five AP computer science test-takers, all were white or Asian and male. Surprising result! We knew that AP CS was growing quickly (see Code.org blog post), but AP Physics just took a giant leap forward. I wonder why that is, and what we can learn from that. The number of students taking the physics test doubled between 2014 and 2015. The College Board, the nonprofit that administers the AP program, said that represents the largest annual growth in any AP course in history. It’s always worthwhile to consider thoughtful critiques seriously. The author’s points about CS being mostly free of models and theories is well taken. I do believe that there are theories and models used in many areas of CS, like networking, programming languages, and HCI. I don’t believe that most CS papers draw on them or build on them. It’s an empirical question, and unfortunately, we have the answer for computing education research. A recent multi-national study concluded that less than half of the papers in computing education research draw on or build on any theory (see paper here). I wrote my May Blog@CACM post on the “Babble of Computing Education,” about the wide variety of perspectives, definitions, and cross-purposes going on in the US in computing education. At the end, I talk about the new Code.org partnership with the College Board and how this may reduce the Babble — the definition of CS Principles will become Code.org. Owen Astrachan, co-PI of the NSF CS Principles grant, and I have a bet for dinner and beer that we made on Facebook. I predict that in the first offering of the AP CS Principles exam, more than 50% of the schools that teach CSP and send students to the exam will be using Code.org curricula. He thinks that there will be greater diversity. I don’t know how the new partnerships announced below fit into our bet. BJC, PLTW, and other curricula are now going to be promoted by Code.org as their partners. Will a school adopt BJC because Code.org recommends it? I think that’s likely. Will the school believe that they are adopting a curriculum out of Berkeley or a Code.org curriculum? I expect the latter. From schools’ perspective, all the eleven new partners will be Code.org curricula. The definition of CS Principles will become Code.org. That’s not necessarily a bad thing — that may provide a corporate face that will assure administrators in schools who don’t know CS. When Code.org meets with school districts, it will now also highlight the new partnerships as alternative ways to teach computer science versus utilizing Code.org’s own programs. via Code.org inks 11 new partnerships to help expand computer science education – GeekWire.